I make A LOT of Waffles! Bring on any kind of topping and yes, just dig right in. and then top them with just about anything. spark your creativity while preparing breakfast. What's your favorite way to eat waffles? I've got another busy week planned here!! I hope you all have a splendid week! Did I make you hungry?? I like mine with maple syrup. We haven't had those in a while. I think we'll have to have some this weekend. Yum! I always eat them with butter, a bit of syrup, powdered sugar and whipping cream! Sometimes we have them for dinner. Oh! And I forgot! Another waffle must....freshly sliced strawberries! Happy Fall Amy! When we lived in Ca. 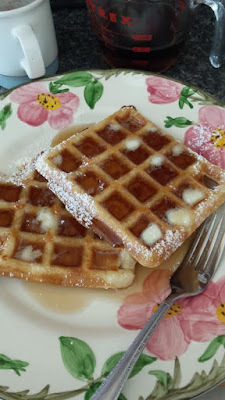 I made Belgian Waffles all the time(of course my girls were at home then), would top them with fresh fruit and syrup. Now that I am gluten free I don't make them anymore, as we gave away our waffle maker before we moved. I have to say I should start again though, because you just can't find a decent gluten free waffle. I do love them. My daughter makes gluten free Oat pancakes and waffles. Well, I do love waffles, but never make them. We're a pancake family. :) But I do enjoy adding tons of different toppings to them for variety. And my favourite way to eat pancakes is to put coconut oil on cinnamon pancakes spread a bit of brown sugar over it and then roll up and eat with my hands. :) I did this as a child, and I still love it. But homemade fruit syrup is my second favourite. Perhaps one day I'll have a waffle maker. OH thanks a lot! And my waffle maker broke! I guess I just have to come to your place! I wish. I'd love to sit and eat waffles with you and Roxy!